Mr Groves said the data showed that in terms of the quarterly change in the annual median, there were some new comers to the top performing suburbs list. 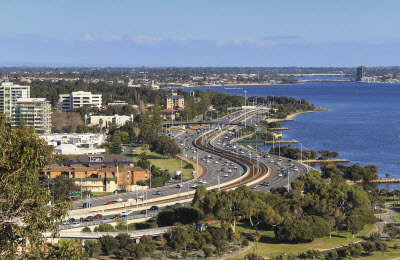 “The best performing suburb was St James in Perth’s central sub-region, which topped the list with a 5.1 per cent increase to its quarterly annual median, followed by Mount Claremont with 4.5 per cent,” Mr Groves said. In Perth’s unit market, East Fremantle led the charge in the September quarter, with its quarterly annual median lifting a healthy 6.2 per cent, followed by Highgate and Cockburn Central, which tied with a 5.0 per cent lift, followed by North Fremantle which posted an increase of 4.9 per cent. Mr Groves said although there were some new entries in the mix for quarterly annual median price changes, when it came to the top selling suburbs, the results were more familiar. “Baldivis continued to dominate for houses this quarter with 469 house sales, followed by Ellenbrook with 420 sales and then Canning Vale in third place with 413 sales. Renowned for their appeal to first home buyers, these suburbs continue to dominate in a market skewed by weaker trade-up activity and prominent first time buyers. “For units, East Perth came in at number one with 288 sales for the three months to September, with Scarborough coming in second with 238 and Perth third with 224 sales, showing that the inner urban apartment market continues to entice buyers,” Mr Groves said. Throughout the September quarter, the stock of listings for sale hovered above the long term average of 12,000 to sit at around 15,100 for the quarter. Over the past week, listings for sale in Perth have nudged over the 16,000 mark, levels not seen since the immediate post GFC days. “With these stock levels of property available in Perth, prospective buyers considering a purchase in the WA property market are under less pressure to make a hasty buying decision,” Mr Groves said. While reiwa.com data shows that sales volumes have dipped during the September quarter, there was a slight increase in volumes last week to take the range to between 500 to 700 sales per week since April this year. “We estimate that total dwelling sales for the quarter will come in at around 8,600 sales across WA, below the average and fewer than the June quarter, although the winter months normally return a subdued sales volume measure,” Mr Groves said. As to be expected, present market conditions had an influence on selling days and discounting across the quarter. “The average number of selling days for the Perth metro region is now at 62 days, which is up five days on the June quarter, while 53 per cent of vendors needed to discount their asking price in order to sell,” Mr Groves said. The $3,000 First Home Owners Grant for established homes was officially abolished on 3 October. Mr Groves said the news of this impending cut had had an impact on first home buyer grant activity. “As expected the Government’s decision to cut this grant for established homes saw a spike in grant activity in September as first time buyers rushed to meet the cut off. “The Office of State Revenue (OSR) reports that there were 862 paid grants in September versus 799 paid grants in August 2015, which is an increase of eight per cent over the month. Established home grants also represented 53 per cent of total grants paid over the quarter,” Mr Groves said. For the month of September, the OSR reports that there were 767 grants paid for new builds, a figure consistent with the August figure. Across regional WA, the quarterly data shows mixed results throughout non-metropolitan areas. “Most regional centres recorded either no change in their quarterly growth or slightly negative growth. “Busselton has once again shown positive annual growth at 3.8 per cent with 438 sales, while Albany had an annual growth of 2.9 per cent with 421 sales, while Kalgoorlie-Boulder took out third spot for annual growth with 1.9 per cent and 326 sales,” Mr Groves said. The median rent price for both houses and units in Perth retreated across the quarter, with the overall median dropping $20 to now rest at $400 per week, which breaks down to $420 for houses and $395 for units. Mr Groves said WA’s rental market was feeling the impact of slowing population growth coupled with improved housing supply. “The most recently released population figures from the ABS shows that net interstate migration into WA has now declined by almost 38 percent in the March 2015 quarter. Population movements have a significant impact on the Perth rental market and this is evidenced by the lower median prices observed in the three months to September 2015. “There has, however, been a lift in net overseas migration by 150 per cent during the same period, which saw rental stock stabilise over the September quarter to sit in a range of between 8,000 and 8,500, following the peak in July,” Mr Groves said. The rental vacancy rate for the three months to September sits at 5.6 per cent in the Perth metropolitan area availing tenants plenty of opportunities to secure an affordable home in a central locale.